Non-creationists do not believe there is objective evidence for a young earth. However, landforms now provide that evidence. Many landforms, including worldwide erosion surfaces, are dated tens of millions to occasionally over 100 million years old, and yet they are little eroded. Many scientists do not accept their old age because erosion rates are too fast. But, according to C.R. Twidale (1998), the evidence for their old age is overwhelming based on radiometric and fossil dating. However, the existence of these old erosion surfaces is more an indictment of uniformitarian dating methods. Geologists are searching for mechanisms to slow erosion on these landforms, but it does not solve the problem. Erosion surfaces, which are not forming today except on a small scale, provide much better evidence for the Recessive stage of the global Genesis Flood. Quantitative information from erosion surfaces in Montana, U.S.A., and adjacent Canada provides powerful evidence for rapid currents flowing off the land during the Flood. Many creationists believe in a young Earth from Scripture. They base this confidence in God’s word, and that He not only was the only observer of the prehistoric past, but also that He was able to influence men to accurately write His words in Scripture. Non-creationists, on the other hand, claim that our belief in Scripture and a young earth is blind faith. They commonly point to radiometric dating methods as proof that the earth is billions of years old, contrary to a straightforward reading of Scripture. Creationists have written much on dating methods, pointing out their many assumptions and their unreliability.1 But still, these dating methods come up with millions or billions of years. Is there any objective evidence that the dating methods are highly exaggerated? Yes, it has been accumulating for many years. One major line of evidence consists of landforms that are dated quite old, while common sense indicates they should have disappeared in a short time within the alleged geological time scale. Therefore, there is something wrong somewhere in dating methods that come up with millions and billions of years. Note that in this definition, an erosion surface is believed to have been smoothed by running water. This idea is probably based on the veneer of generally rounded rocks that carpet many of them. For example, the Cypress Hills erosion surface in southeast Alberta and southwest Saskatchewan is capped by a thick veneer of well-rounded gravel, cobbles, and boulders of mostly quartzite.9 Based on various radiometric and fossil dating techniques, geologists have discovered that many erosion surfaces (which were not exhumed from beneath other rocks) and the sides of some river valleys have hardly eroded in many tens of millions of years of alleged time. For instance, the flat to undulating plateau of western Arnhem Land, Queensland, is dated at over 100 million years old based on late Jurassic and Cretaceous fossils found in sediment within shallow valleys cut on the erosion surface.10 These fossils put a minimum age on the erosion surface. Based on K-Ar dating of basalt lava that had flowed into the ancestral Shoalhaven River Gorge of southeast Australia, uniformitarian geologists were surprised to find that the walls of the gorge had retreated only 10 m in 30 million years!11 The river is essentially ancient and its width has changed little over many of millions of years, according to the dating technique. Erosion surfaces are very distinctive when the erosional mechanism has truncated tilted sedimentary rocks or granitic rock (Figure 1). The mechanism that sheared dipping sedimentary rocks eroded both soft and hard rocks evenly, sometimes leaving a capping of rounded rocks. The soft rocks remain generally uneroded today, indicating that nature has not had enough time to carve valleys in them. Some erosion surfaces are cut entirely on soft rocks, for instance those erosion surfaces cut on argillite in the central Flinders Ranges.17 The interesting aspect of these erosion surfaces is that they are large scale and relic, (i.e. survived disintegration and decay by erosion) or at least it is very difficult to relate them to present processes despite numerous attempts over the past century.18 Except on a local scale, they formed in the past by some unknown mechanism but are observed being dissected today. Twidale claims such erosion surfaces are quite old, some much older than 100 millions years, based on radiometric and fossil dating. The task is now ‘... to account for the seemingly impossible ...’.19 He rejects William Morris Davis’s ‘cycle of erosion’ and other such cyclic schemes and leans towards Crickmay’s ‘Hypothesis of Unequal Activity’,20,21 which Twidale admits only diminishes the problem without solving it.22 Davis’s ‘cycle of erosion’ was immensely popular during the first half of this century, but it is mostly rejected today, especially because it is mostly hypothetical with no current examples of a ‘peneplane’ forming today at sea level (base level). The cyclical schemes of Lester King and Walther Penck have fared no better.23 These cyclical hypotheses were attempts to account for the many erosion surfaces observed over the earth. Crickmay essentially believes that rivers account for most of the erosion of continents and their erosional activity is unequal. He is correct, but it is not particularly enlightening. Crickmay’s hypothesis is supposed to account for the survival of high level erosion surfaces formed by water. However, today these erosion surfaces are observed weathering and eroding. So although the rivers can erode faster (unequal activity), his hypothesis still does not account for old landforms formed by water but barely touched by erosion over tens of millions of years, since even the slower erosion rate on these erosion surfaces should soon destroy them. One would expect soft rocks to easily form a drainage network that would soon destroy the flatness. Some geologists appeal to a dry climate as a preserving mechanism, but during geological time, erosion surfaces are expected to have passed through several climatic regimes. Australia supposedly has been slowly drifting northward from the mid and high latitudes during the past 100 million years of geological time. Although much of southern and central Australia has a dry climate today, these areas would have been much wetter during the Tertiary. Besides, erosion is not suspended in a dry climate. Summerfield lists average denudation rates for various climates and relief, based on both the solid and dissolved load of major rivers today.27 A landscape in a dry climate with low relief denudes at roughly 5–35 mm/1000 years. This is quite fast. Flat or nearly flat erosion surfaces are not expected to last long. Erosion surfaces better speak of a mechanism that occurred in the past but is no longer in operation today. It was a worldwide mechanism, since erosion surfaces are seen all over the earth. The mechanism was large scale, able to quickly shear hard and soft rocks evenly, and then erode the whole rock mass further so that erosion surfaces are mostly left as remnants. It was also a watery catastrophe based on the generally rounded rocks capping many erosion surfaces. Furthermore, it was the last major event to shape the surface of the land before erosion from the present climate began slowly dissecting them. To examine whether a diluvial mechanism for the formation of erosion surfaces is viable, Peter Klevbeg and I quantitatively examined the two highest surfaces in the region where we live.31,9 The highest erosion surface is represented by the Cypress Hills of southeast Alberta and southwest Saskatchewan, Canada. This erosion surface is a remarkably flat plateau about 130 km east-west and averaging 30 km north-south. The western end lies at an altitude of 1466 m above sea level (ASL), 300 m above the next highest erosion surface. The erosion surface slopes eastward at about 2.7 m per km to an elevation of 1070 m ASL at the eastern end, which is about 100 m above the erosion surface below. The western end of the erosion surface lies about 600 m above the rivers to the north and south. The erosion surface has been dissected probably by glaciofluvial activity. The most striking feature of the Cypress Hills erosion surface is that it is capped with about 25 m of mostly massive gravel, cobbles and boulders, predominantly of well rounded quartzite in the western and central portion. The eastern portion has many sand interbeds containing abundant mammal fossils. The largest clast we found had an a-axis of 39 cm, a b-axis of 24 cm, and a mass of 26 kg. The second highest erosion surface is considered the Flaxville surface, which is mainly composed of large plateaus in north central and northeast Montana. This surface is similar to the Cypress Hills surface and the rocks are virtually identical. (It is interesting that the mammal fossils associated with both erosion surfaces date the rocks at 1 million to 45 million years and yet the rocks are identical and little weathered.) Based on inferred paleocurrent directions in the Cypress Hills, the nearest source for the quartzite is the Rocky Mountains of northwest Montana. Thus, the quartzite has been transported over a very low slope for a distance of at least 300 km to the western Cypress Hills and 700 km to the eastern-most Flaxville plateau. Some researchers now believe that the coarse gravel may have originated from central Idaho.32 So, if this is the case, one has to add another 200 km to the above distances. Intuitively, modern rivers cannot transport abundant cobbles and boulders anywhere near 700 to 900 km on such low slopes. To quantitatively estimate this, Peter employed standard coarse-sediment paleohydrologic equations and calculated that to transport the clasts as bedload, minimum current velocities of 4–6 m/sec with minimum water depths of 3 to 40 m are required. This is close to the fastest flash floods that rush down steep slopes. Unless very narrow channels are postulated, for which there is contrary evidence (geomorphology of the deposits indicate a wide, sheet flow), resulting discharges would have been orders of magnitude greater than historic regional floods. Another distinctive feature of the quartzite clasts is the abundant percussion marks, circular or semicircular cracks, on the hard quartzite, a few 10 cm in diameter (Figure 2). This implies that much of the pebble and cobble size fractions were transported in suspension at times. There is a relationship between the horizontal velocity to keep the clast in suspension and the fall velocity of the clast, which takes into account the mass, shape and spin of the clast.33 Two calculations were performed. A modest-sized spherical clast 10 cm in diameter produced a minimum current velocity of 15 m/sec. A second calculation was applied to the largest non-spherical clast that could briefly be in suspension. For a bladed clast 15 cm wide, Peter calculated a minimum current velocity of 30 m/sec with a minimum flow depth of 55 m.34 This velocity is close to the modern speed limits on the area highways. These numbers defy uniformitarian mechanisms and are much more consistent with a diluvial mechanism. It is interesting that similar quartzite rocks with percussion marks are found over a wide area in the northwest United States and adjacent Canada, including the tops of mountains and in valleys on both sides of the Rocky Mountains. I have found them at many places of northern Oregon and southern Washington. For instance, large quartzite boulders cap several of the mountain ridges in the Wallowa Mountains of northeast Oregon. One well-rounded quartzite clast weighing about 200 kg (Figure 3) was found on a ridge 2500 m ASL. Quartzite does not outcrop in the Wallowa Mountains; the nearest source is 100 km to the east in central Idaho. Post Script—why don’t creationists publish in mainstream journals? I thank Tas Walker [Creation Ministries International] for calling attention to and sending me a copy of Twidale’s article. I appreciate Peter Klevberg for reviewing the manuscript. Woodmorappe, J., The Mythology of Modern Dating Methods, Institute for Creation Research, El Cajon, California, 1999. Return to text. Roth, A.A., Origins—Linking Science and Scripture, Review and Herald Publishing Association, Hagerstown, Maryland, pp. 263–266, 1998. Return to text. Schumm, S., Disparity between present rates of denudation and orogeny, U.S. Geological Survey Professional Paper 454, 1963. Return to text. Oard, M.J., Are those ‘old’ landforms in Australia really old? Joournal of Creation 10(2):174–175, 1996. Return to text. Oard, M.J., K-Ar dating results in major landform surprises, Joournal of Creation 10(3):298–299, 1996. Return to text. Oard, M.J., New dating method calculates unreasonably low rates of granite erosion in Australia, Joournal of Creation 11(2):128–130, 1997. Return to text. Oard, M.J., Australian landforms: consistent with a young earth, Joournal of Creation 12(3):253–254, 1998. Return to text. Bates, R.L. and Jackson, J.A. (eds), Dictionary of Geological Terms, third edition, Anchor Press/Doubleday, Garden City, New York, p. 170, 1984. Return to text. Oard, M.J. and Klevberg, P., A diluvial interpretation of the Cypress Hills Formation, Flaxville gravel, and related deposits; in: Walsh, R.E. (ed. ), Proceedings of the Fourth International Conference in Creationism, Creation Science Fellowship, Pittsburgh, Pennsylvania, pp. 421–436, 1998. Return to text. Nott, J. and Roberts, R.G., Time and process rates over the past 100 Ma: a case for dramatically increased landscape denudation rates during the late Quaternary in northern Australia, Geology 24:883–887, 1996. Return to text. Nott, J., Young, R.W. and McDougall, I., Wearing down, wearing back, and gorge extension in the long-term denudation of a highland mass; quantitative evidence from the Shoalhaven Catchment, south-east Australia, Journal of Geology 104:224–332, 1996. Return to text. Twidale, C.R., Antiquity of landforms: An ‘extremely unlikely’ concept vindicated, Australian Journal of Earth Sciences 45:657–668, 1998. Return to text. Twidale, Ref.12, p. 657. Return to text. King, L.C., The Morphology of the Earth—A Study and Synthesis of World Scenery, Hafner Publishing Company, New York, NY, 1967. Return to text. Twidale, Ref. 12, p. 660. Return to text. King, L.C., Wandering Continents and Spreading Sea Floors on an Expanding Earth, John Wiley and Sons, New York, NY, p. 188, 1983. Return to text. Twidale, Ref. 12, p. 663. Return to text. Crickmay, C.H., The Work of the River, Elsevier, New York, p. 140, 1974. Return to text. Twidale, Ref. 12, p. 662. Return to text. Crickmay, Ref. 18, pp. 1–271. Return to text. Crickmay, C.H., The hypothesis of unequal activity; in: Melhorn, W.N. and Flemel, R.C. (eds), Theories of Landform Development, George Allen and Unwin, London, pp. 103–109, 1975. Return to text. Summerfield, M.A., Global Geomorphology, Longman Scientific and Technical and John Wiley and Sons, New York, NY, pp. 457–480, 1991. Return to text. Crickmay, Ref. 18, p. 173. Return to text. Twidale, Ref. 12, p. 664. Return to text. Crickmay, Ref. 18, pp. 207, 209. Return to text. Summerfield, Ref. 23, p. 396. Return to text. Lidmar-Bergström, K., Olsson, S. and Olvmo, M., Palaeosurfaces and associated saprolites in southern Sweden; in: Widdowson, M. (ed. ), Palaeosurfaces: Recognition, Reconstruction and Palaeoenvironmental Interpretaion, Geological Society of London Special Publicaton No. 120, pp. 95–124, 1997. Return to text. Oard, M.J., An Ice Age Caused by The Genesis Flood, Institute for Creation Research, El Cajon, California, 1990. Return to text. Walker, T., A biblical geologic model; in: Walsh, R.E. (ed. ), Proceedings of the Third International Conference on Creationism, Creation Science Fellowship, Pittsburgh, Pennsylvania, pp. 581–592, 1994. Return to text. Klevberg, P. and Oard, M.J., Paleohydrology of the Cypress Hills Formation and Flaxville gravel; in: Walsh, R.E. (ed. ), Proceedings of the Fourth International Conference in Creationism, Creation Science Fellowship, Pittsburgh, Pennsylvania, pp. 361–378, 1998. Return to text. Lackie, D.A. and Chell, R.J., The Cypress Hills Formation (Upper Eocene to Miocene): a semiarid braidplain deposit resulting from intrusive uplift, Canadian Journal of Earth Sciences 26:1918–1931, 1989. Return to text. Blatt, H., Middleton, G. and Murray, R., Origin of Sedimentary Rocks, Prentice-Hall, Englewood Cliffs, NJ, 1972. Return to text. Klevberg and Oard, Ref. 31, p. 373. Return to text. Vardiman, L., RATE group prepares status report, ICR Impact #314, Institute for Creation Research, El Cajon, California, 1999. Return to text. 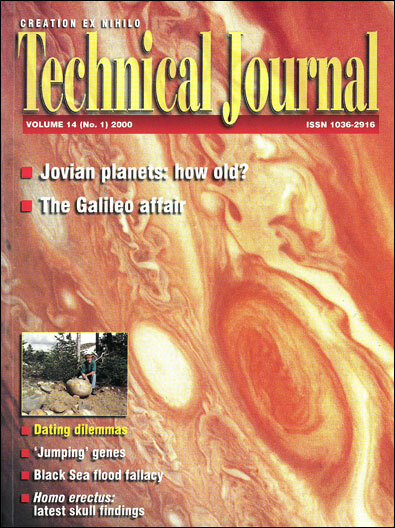 Buckna, D., Do creationists publish in notable refereed journals?, 18 November 1999. Return to text.